All development efforts start out to fulfil a set of requirement but the manner in which those requirements are documented or expressed has a tremendous impact on the effort’s success and cost. 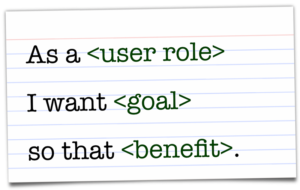 The technique of ‘user-stories’ originated with agile processes, but is effective for all initiatives, agile or not. This class provides the knowledge and tools needed to identify and write effective and accurate user stories. Participants will learn the six attributes all user stories must exhibit as well as the five additional guidelines for taking user stories from good to better. The class will also explore the use of user role modelling to write the tricky initial user stories for a project. During this hand-on course, participants put theory into action when identifying user roles and writing user stories for multiple case studies. This course is licensed from Mike Cohn of Mountain Goat Software. Mike is the author of the most popular book on this subject: User Stories Applied: For Agile Software Development. This course has been delivered to numerous professionals around the world. PDUs: For Project Management Professionals, this course may lead to 7 PDUs as approved by the Project Management Institute.